Are you unsure about how to handle math with your child? Does paper and pencil math move them (and you) to tears? 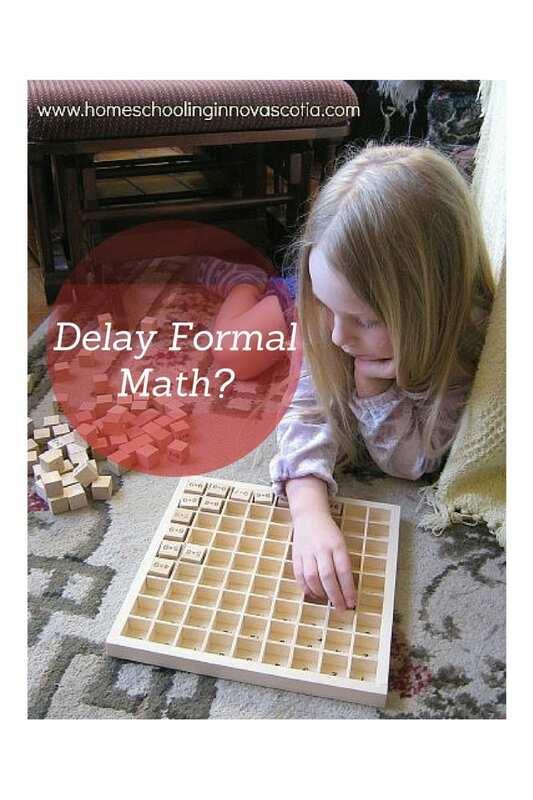 When does your child need to begin formal math instruction? Kindergarten/Primary? Grade 1? Or can they begin even later? You might be surprised to know that in our homeschool, formal math instruction began around Grade 4 age. This wasn’t something we arrived at before we began homeschooling, but something that happened gradually. When each of our children were merely toddlers, my husband would naturally engage with them in ways I didn’t think of myself: counting stairs when going up and down or asking them to point the way while they were riding on his shoulders – left or right, north or south. He instinctively started dealing with spatial consciousness and numeracy. We played games in the car that involved estimating speed and distance, such as guessing what time we would reach our destination and seeing who was closest. When our firstborn was three, my husband started playing chess with him, along with other board games. We started giving him a small allowance at age three so he could naturally learn how to count and handle money. Already a Star Wars fan at about age five, we bought him the Star Wars Math CD-Rom. We were delighted to see that he was learning so many great math concepts simply by playing games. We were starting to see that math fun could happen anywhere. However, we still thought he had to use a formal math program and tried a few math curricula. Our son hated pencil and paper math and resisted it – there were complaints and even tears. We were frustrated, but knowing that he had an aptitude for math and not wanting him to develop an aversion to it, we backed off. We encouraged him to keep playing math games on the computer, and board games too, including chess. When our son was about nine years old, we gave a computer-based curriculum a try – Teaching Textbooks. It was a hit! He loved spending time on the computer and, being a very auto-didactic child, loved doing the work on his own. But how did he do? Did having very little experience with formal math instruction up to that point doom him to struggle with it? Not at all. He had no problem jumping right in. We followed the same path with our daughter – no formal math instruction to begin with. She didn’t show the same aptitude for math as her brother, but she had fun with Cuisenaire rods, math shape blocks, board games, and video games. And she also started receiving an allowance at age three in order to learn about money. Like her brother, she began learning about fractions and measurements through baking in the kitchen with me as a toddler/preschooler. When our daughter was eight years old, we had the opportunity to review an online math program, ALEKS, for a few weeks. She had no problem picking it right up, and in just a few weeks had completed a quarter of a full year program. When she began studying Grade 4 level work, we started formal math instruction using Teaching Textbooks as well. While our daughter does complain about math from time to time, and takes her time with it, she usually gets things correct on the first try. I am not the first to delay formal math instruction – historically, math instruction was delayed until age 10 or even later right up into the 20th century. Research has been done that supports the delay of formal math, finding that children’s brains aren’t ready to think abstractly until around age 10 and that they ultimately do better with formal math when it’s delayed. My hope is that my children will both continue to enjoy math, having been able to have fun with it from a young age. Math in the kitchen is still a big hit! Have you delayed formal math instruction in your homeschool? How do you make math fun? Please let me know in the comments below! Loved this article. Wish I had seen it 5 years ago. Of course, I wish I had known so much more about homeschooling vs “regular” schooling. I’m so glad you enjoyed it! Yes, it can be very difficult to think outside the box when you’re getting started.